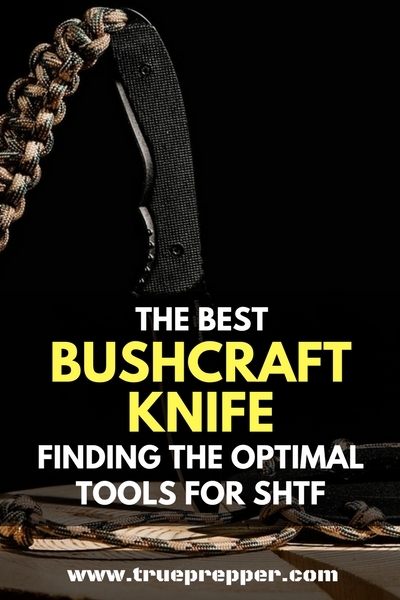 Finding the best bushcraft knife can be tough with all the information out there. People from many different walks of life embrace bushcraft, and many have different preferences for the best type of survival knife. Not to mention the sites pushing hollow handle ‘survival’ knives that wouldn’t survive one day’s hard use. We aggregated actual survivalists preferences to narrow down the top contenders and then took an objective look at how each measures up. Our favorite for a while now has been the Morakniv, but tried to keep our bias to a minimum. The best bushcraft knife can arguably be narrowed down to four options. Whichever one you go with is a matter of personal preference, time available, and your budget. All of these knives are tried and true, field proven, and keep a simple design that works. Any ‘survival knife’ with a hollow handle and junk stored inside of it should not be considered when picking a knife you may need for actual survival. Folding knives are great for EDC, but simply are not as durable as the (mostly) full tang knives we evaluate below. If you ask any experienced survivalist what the best budget bushcraft knife would be, they would almost always suggest a Morakniv. Morakniv is known for their quality blades, and the bushcraft knife is no exception. It does come in a blade options, but we suggest carbon steel since it is easier to keep sharp. You may want to opt for the stainless blade option if you feel like you won’t be maintaining the blade with oil. The bushcraft knife comes with a sharpener embedded into the sheath, as well as a place to hold the included fire starter. The Bushcraft Knife is one of the more sturdy knives in the Morakniv catalog, as the blade is thicker than the others, making it great to baton with. The spine is ground to 90 degrees, so using the fire starter is much easier. The black DLC coating helps prevent the blade from rusting, but it is best to wipe the blade after each use and oil it regularly, since it is carbon steel. It has a rubberized non-slip grip, making it great at filleting fish or other slimy requirements. Standard issue for swedish pilots, the Fallkniven has earned it’s keep as one of the best bushcraft knives available. It is tried and true and has been around since 1984. Laminated stainless is used because it is actually over 20% stronger than solid stainless steel. Since bushcraft one of the more demanding activities to put a blade through, this is a great feature. The thermorun handle gives the knife a good grip, even when wet or muddy. The included zytel sheath is a nice add-in, since it is easy to clean and protects the knife rather well without being too bulky. The ESEE knives come in a wide range of lengths and types, but we settled on the 6” model. ESEE as a brand has a storied history grounded in survival and bushcraft, with the owners designing the well known RTAK and RAT bushcraft knives for Ontario Knife Company, among others. The designers created their own company, which eventually became ESEE. 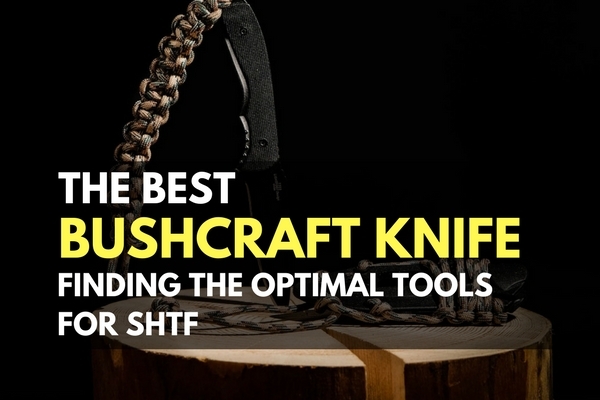 They are now considered one of the best bushcraft knife makers in the business. The ESEE 6P comes with a 6.5” drop point 1095 carbon steel blade, with an easy to maintain flat grind. The handle is made out of Micarta, which handles exceptionally well when wet or muddy. One of the best ways to get connected to a knife and learn everything you need to know about one is to make one. Not everyone has the resources, time, or money- but if you do and are remotely interested, it can be a very rewarding experience. You can also personalize your shape, type, and the materials of your knife. The YURT guide uses widely available materials to make a pretty good survival knife in just an afternoon. If you are experienced in bushcraft, then knife making should be right up your alley with it’s shared emphasis on creating functional art. Many of the problem solving skills you use for bushcraft will be needed to create your very own custom knife. The Knife Network Forum has an abundance of information on it and plenty of people willing to help you design your first knife. Check them out for more information on how to get into knife making. As mentioned earlier- personal preference and experience should weigh heavily for your choice. We would suggest the Morakniv for any beginner or anyone on a budget. Later on, you can pick up the ESEE and use both for a huge amount of functionality. Use the Morakniv to filet and do other delicate tasks, and the ESEE to baton and the ‘muscle’ tasks- you get the picture! If you are experienced and plan on carrying just one knife, we strongly suggest the Fallkniven F1. Unless, of course, you are prepared to take the plunge in creating your own bushcraft knife. If you do not own a bushcraft knife at all, 99% of the time the Morakniv should be suggested since it is cheap, sturdy, proven, and multi-functional. A blade design that allows you to do all the usual bushcraft tasks would include a drop point, long cutting edge, and flat spine. This will allow you to baton, drill holes, carve, and feather wood easily. The flat spine will work great with a fire starter too. Other blade types that work well for bushcraft include the spear point, parang, and kukri, with the last two making great knife-machete hybrids. The grind type is important on a bushcraft knife because it can affect how easy the knife is to maintain. A knife with a double bevel, or axe grind can take some skill to sharpen on a flat stone. Most homemade bushcraft knives use wood as a handle, since it is easy, workable, and relatively cheap. Store bought bushcraft knives often opt for rubberized or composite handles since they work much better than wood in wet and muddy conditions. One handle consideration is whether or not the blade is full tang. The Morakniv Bushcraft that we just suggested above, believe it or not, is not a full tang knife. While full tang knives have been a staple of good bushcraft knives, there have not been many reported problems with the Morakniv ‘rat tail’ style knife. I assume they left the extra steel out to save money, but it does not seem to impact the knive’s durability drastically. Stay clear of hollow handle survival knifes. Although they seem like a great deal with all the storage in the handle, the sacrificed tang makes them very fragile and unreliable. The best sheath is usually just personal preference. It will do the job if it protects the knife, keeps it close to your body to avoid snagging, and is durable. Some sheaths, like the Morakniv Bushcraft have a few extra things going on, like fire starter storage. This comes in handy a little more than you would expect, since losing your fire starter is not something you want to have happen in a survival situation. A good bushcraft knife can be the finishing touch on a bug out bag or get home bag. Whether you buy a nice knife, or make your own be sure to keep up on maintenance of it. Like a firearm, maintenance will help you stay familiar with it and keep it in working order. Keep exploring, stay prepared, and be safe. ← The Cash Stash for a Prepper’s EDC: Keychain, Wallet, or Hidden? I prefer an American-made knife. My two main knives are a Buck 124 and an Ontario. Both are fixed-blade Bowie-style. I just got the Ontario RAT folder for EDC and love it. I like the Moras because they’re inexpensive and get the job done. I don’t typically go out into the woods with just a knife to survive so the Mora knives suit me pretty well. I have a Condor Bushlore. I love the no-nonsense look and feel. Best leather sheath around, easy to sharpen, holds an edge very well. Best of all low price. Condor makes good knives. Definitely in the top 5, but when I had to trim it down to three it left ESEE, Fallkniven, and Mora.